So what do you do? – Nice dress! Thanks, I made it!! When I was young I loved browsing through the Sears catalogue. I would look through page by page and mark all the things I wanted to create my brand new wardrobe. 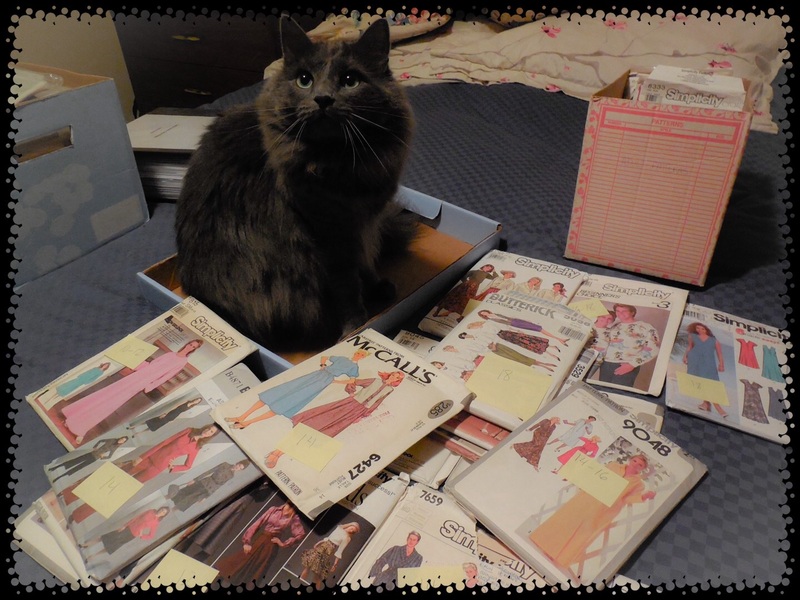 Is it no wonder I decided that the best way to display and store my sewing patterns is in binders and boxes. 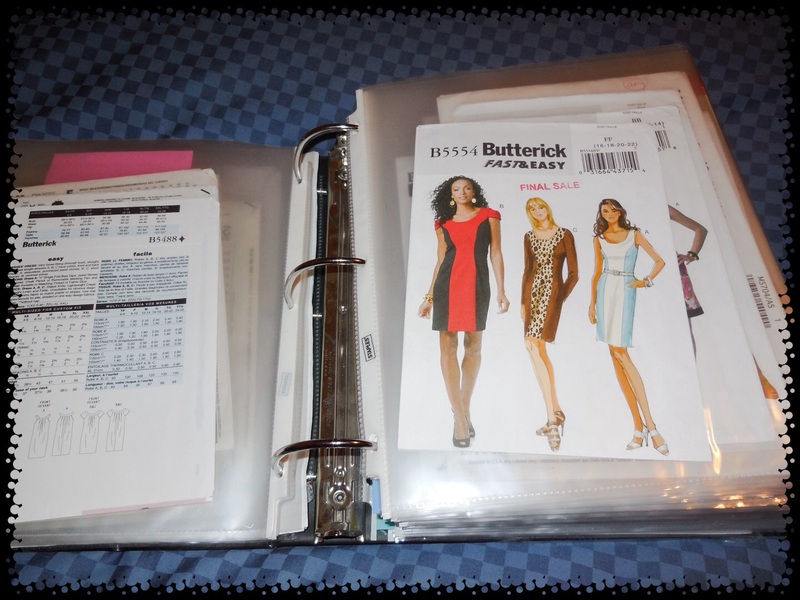 Now I browse through my binders and plan my wardrobe and choose my next sewing project. 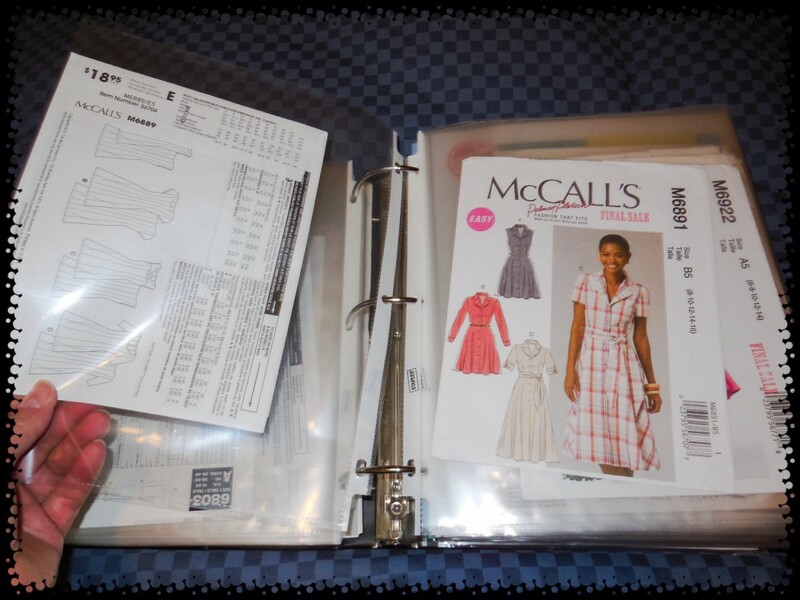 My system is to put my pattern envelopes in plastic pages, under tabs for dresses, coats and cardigans, skirts, pants, etc. 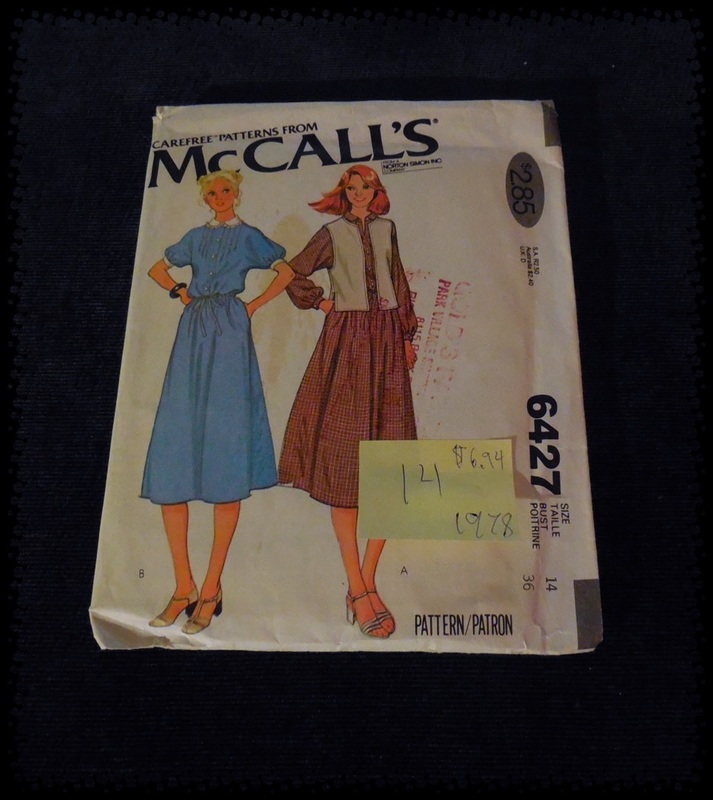 When I want to make a dress, I browse through all my pages and I can easily see the front pictures and the back information – notions, fabric, sizing, yardage, etc. 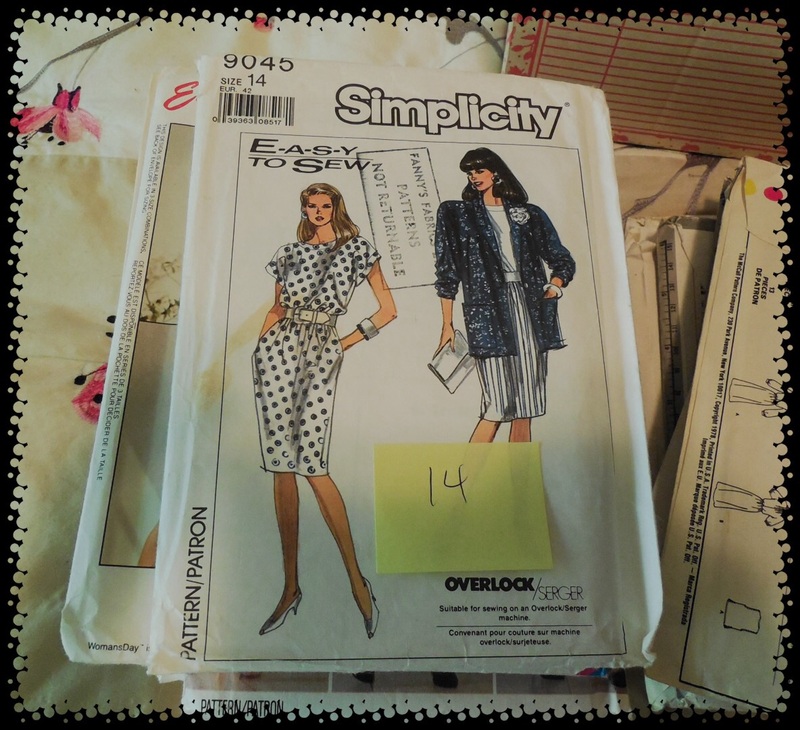 Then when I have decided on a dress I want to make I pull out my pattern box that contains that envelope’s contents (instructions and pattern pieces), all easy to find in numerical order, and off I go! ,,,and it’s instructions and pattern pieces. I even keep my Indie Patterns and my PDF patterns in my binders. 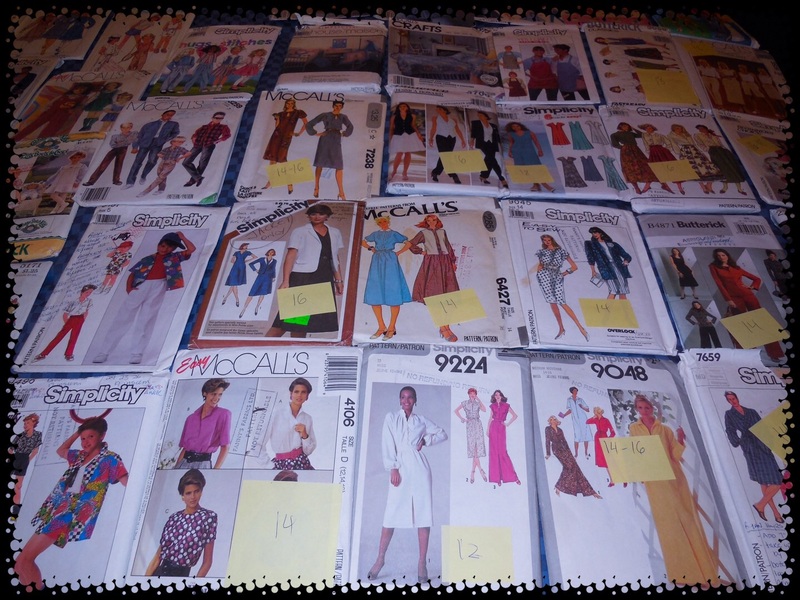 I haven’t counted how many patterns, but they range from approximately the 70’s through to 2010. You definitely need to buy some THICK shoulder pads for this Simplicity pattern from 1989. This seemed to be the most recent pattern, from 2008. 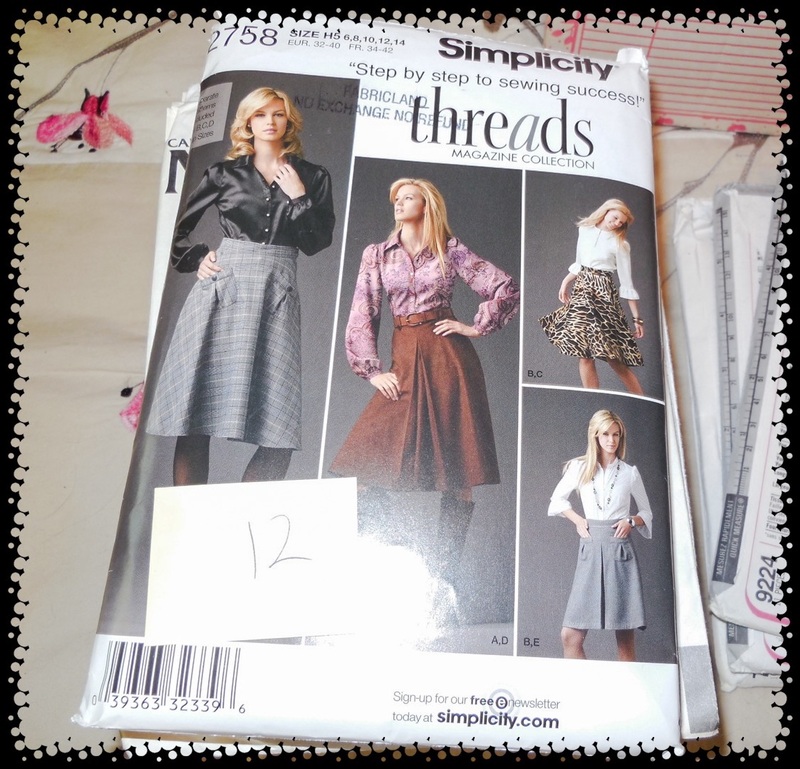 I never knew … “threads” has been involved in sewing patterns for so long! A classy dress pattern from 1979. Another one from 1978, this one with a reversible vest. I have been busy dating these patterns for curiosity sake. Then I will incorporate them into my present display and storage system. November is going to be a special month for me – my one year mark for my blog! I am working on a couple of things for my blog that just might be interesting, so stay tuned! So I ask you…. 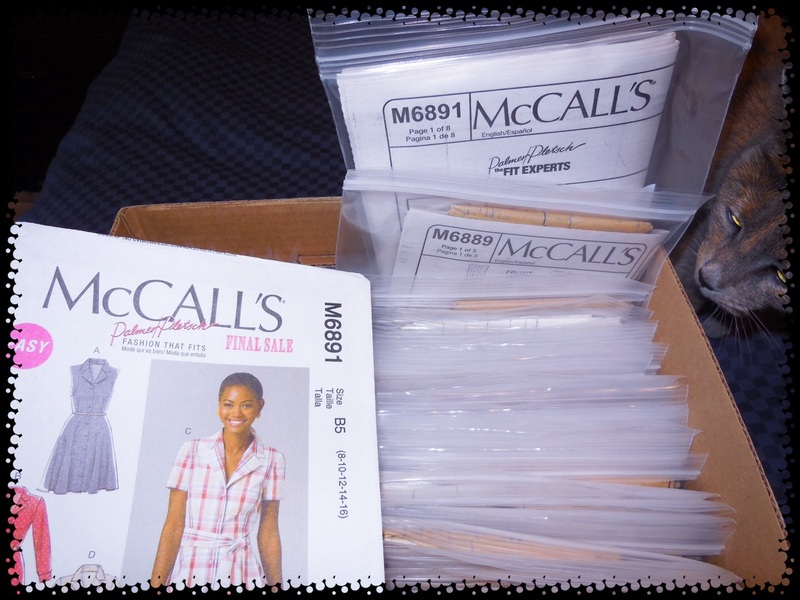 in the meantime… How do you store your patterns? Yes, she is! and it is so fun to get new stuff!! Things are a bit of a mess here! This also includes fabric mess. I need to get things sorted. I’m going to tackle it in the new year. Your system looks great. Oh well! Mess Happens! I have no room for my sewing stuff so I have always had to be portable. I trundle my things from room to room looking for free space! I have a sewing table that folds up into a little cabinet on wheels that hides my two machines… Can’t tell you how happy I am that my Mother said “Buy It Now”, I have had it for years, otherwise I don’t know how I would manage! My fabric on the other hand is in a see through Rubbermaid bin. I have a photo and fabric details on my IPad – a bit of a mess! I like your binders! I two am a binder gal- for swatches, ideas, pics. My patterns I sort into decorative wire baskets that sit mostly on a bakers rack. Once I’ve started a pattern it goes into a plastic sleeve with a cardstock sheet that has a swatch and changes I made. Not as tidy as yours!!! Thank you! I have yet to sort my fabric, but I read somewhere about swatches and fabric details on cards in plastic photo pages with slots the same size as the cards. I still have that project to tackle! 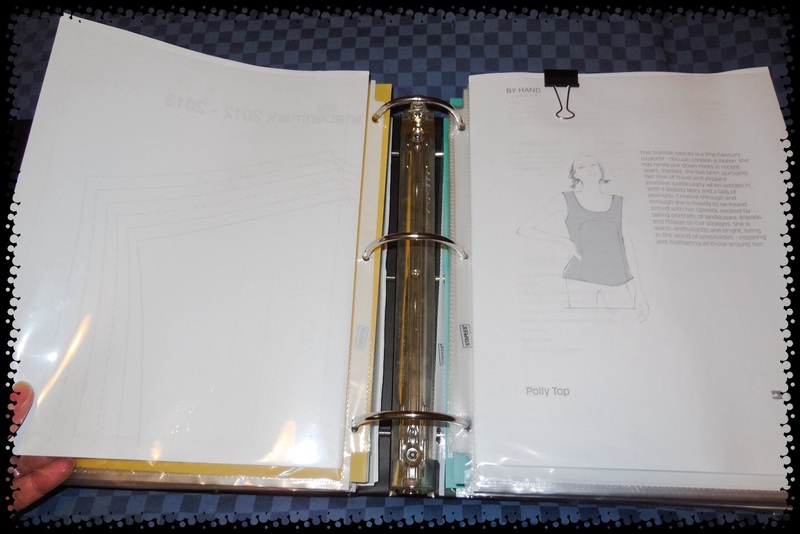 Then after something is completed you transfer the fabric card (with your sewing notes added) to your binder with the pattern page. Similar to your idea – Good Idea! 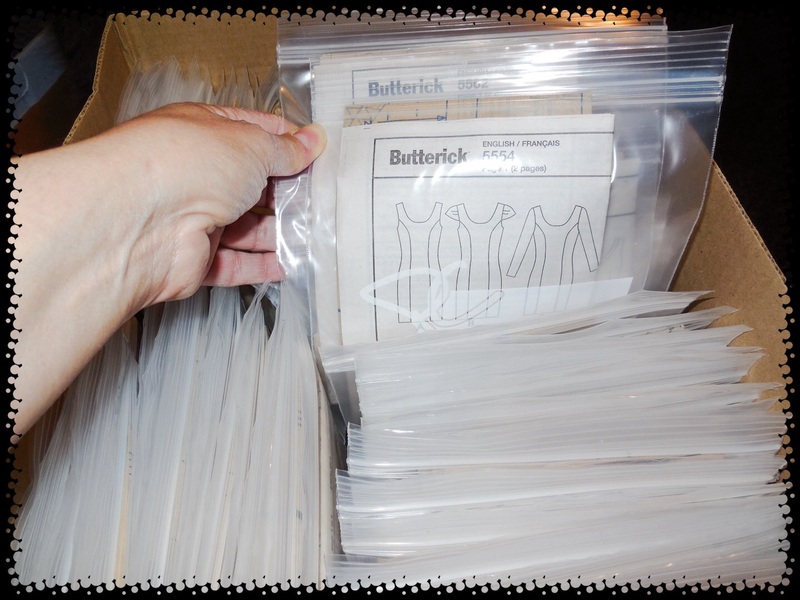 I have learned so much about altering, sewing and fabric by saving my comments as I sew. Sooner or later, if I make notes, it sinks in! Wow! Those are a lot of patterns. I remember our sister had gone on a vacation to Hawaii. She had this off-white material which had little red strawberries on it, because she was making a festive dress for her trip. I remember when she was done, we would get the scrap material to make clothes for our Barbies. Now, who made my Barbie the pants out of the off-white material with the little red strawberries? I must have really liked that material to still remember it. Wouldn’t that be something if our mother still kept all those Barbie clothes. Seriously, our Barbies had awesome wardrobes! Ok I got off track. You were talking about patterns. I think you’re going to have a fantastic time figuring out what to make next. Simon looks adorable. I loved it when the sears catalogue came. i could spend hours with it. Oh ya! It was great! Amazing how much time you could spend with a “picture” book! Then there was the Christmas catalogue, Mom used to hide that one since it arrived so early, and only pull it out a couple of weeks before Christmas. Thanks for the trip down memory lane. I loved sewing and mainly for the reason that I was not built like Barbie so there were always adjustments to be made. Pattern 9224 was my wedding dress (2nd time around) and the first time I made covered buttons. 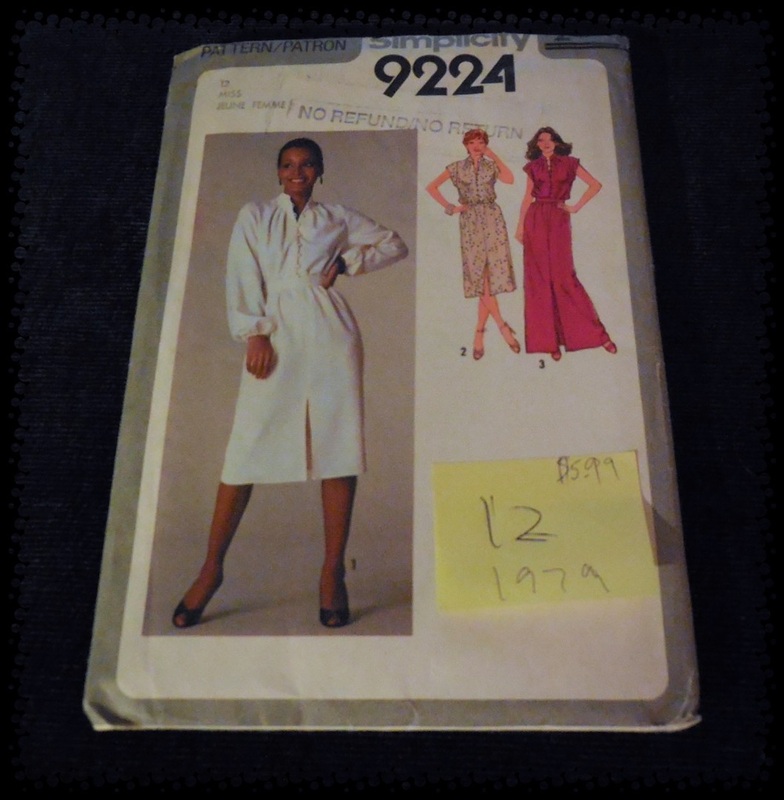 The Simplicity pattern 9045, the jacket (without shoulder pads) would need adjusting but the dress I made a few years ago and it is very comfortable. Now the outfit with the strawberry pattern was a fun outfit, made during my single years, and let me add…..single men seemed to like strawberries. Linda the binder idea for organizing patterns is a much better one than the box because the box involved too much bulk when looking. Your talent far surpasses mine, I enjoy coming to your blog. I have discovered even an old dog can learn new tricks. Now I know what to do , thanks to you. 🙂 I have a few and they are all over the place right now. This will be my mini November project on getting organized. Love love your idea and collection as well. It must definitely inspire you as you sew :). Will keep you posted on how my mini collection comes together. They are so much easier and nicer to look at this way! It is best to start organizing before it gets out of hand. Step by step, one item at a time, and it’s all set up before it is too big of a project to handle! I guess that goes for a lot of things! I still have to get my fabric stash in order! OK if we’re going to go down memory lane I remember Rose talking me into buying a very bright orange fabric which was supposed to be sewn into a dress for quiet, subdued me. Not a chance! And yes Barbie is built like an alien but she had the advantage of removable limbs..we could pop her arms off if we had any difficulty squeezing that malformed body into her slinky outfits. So jealous of your collection, how exciting to have all those patterns! You’re more organised than me, although I have just started filing away all the pattern tracings I’ve done and my pdf printouts into plastic folders to go into a binder. Well you are on your way then! It’s always more of a necessity to stay organized when you have no room to sew and have to pack it up every night. I am so jealous of those sewist and crafters that can spread it all out and just leave it there! If my pattern collection was that comprehensive I’d spend all my time looking through it. Your organisation is impressive, it must save time searching. Great post and fabulous that your sisters tripped down memory lane with you! I do like your idea of having the pattern envelopes in a format that is easy to flick through. For actual makes I sketch out the details in my Fashionary, include a swatch and any notes on fitting/construction/lessons learned/stuff for next time. I used to include all that in the pattern envelope but it got too messy. Sounds like you have a great collection to sort out there! I love looking at all my choices, my imagination runs wild. I have a separate binder with notes, swatches, etc. for my finished projects. It is nice to look back on if I have a question about a pattern or fabric. Thanks for reading/commenting! What a great idea for pattern storage. I might have to try it. Maybe a project for January. Do you keep each pattern company in it’s own box or do you mishmash them all together? I mish-mash them all together in the binder and boxes. In the binder the important thing for me is to have all my dresses’ envelopes together so I can choose which dress to make, for example. Then in the box they are all mish-mashed together, but in numerical order so I can find the contents of the one envelope I want to make. It is always nicer to organize right from the start, so you don’t have to sort 2 or 3 boxes all at once like I had too. 🙂 Thanks for reading and commenting!